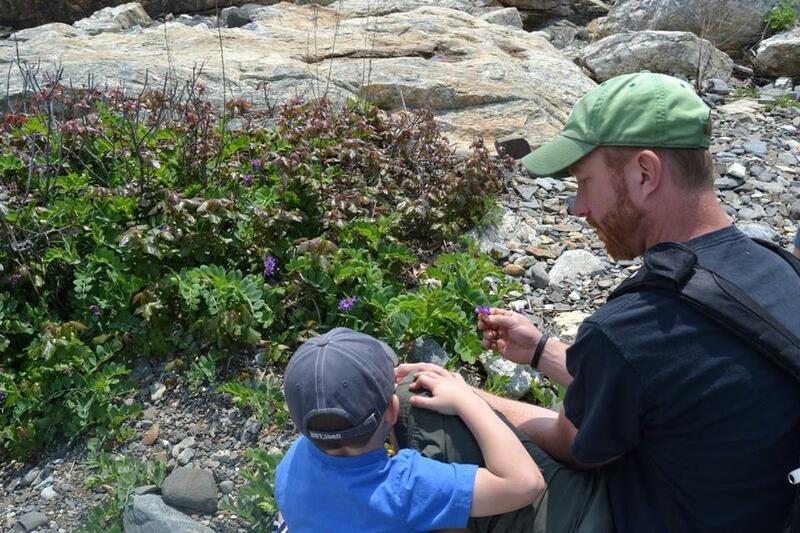 Chef Evan Hennessey forages for plants with his son, Kaden. The air was laden with the briny smell of the ocean and the musty odor of wet seaweed. It was a clear day, and we had a glimpse of the Isle of Shoals in the distance and sweeping views of the Atlantic Ocean. At low tide, we found puddles teeming with sea life as we waded further into the water. “It’s worth the effort,” chef Evan Hennessey said, urging us on as we negotiated through the slippery rocks and shallow pools. “Look, here! An explosion of color — sea lettuce, Irish moss, sugar kelp!” Hennessey said as he picked up a long ribbon of sticky, brown kelp for us to see. “We dehydrate this and put it in all of our stocks. It adds another extra layer and depth of flavor,” he said. We sloshed to the next seawater pool, where Hennessey snatched a floating blob of reddish-brown weeds. “Gracilaria,” he said. “Taste it.” We nibbled a small piece, and were surprised that it tasted OK, more of the earth than of the sea, a little like mushrooms. “I like to use this with sea urchins,” he said, moving on to the next pool. We tasted juniper berries (Hennessey also uses the needles for curing and the stems for smoking), the invasive Japanese knotweed (when young, it tastes a little like rhubarb), staghorn sumac (think: raspberries and citrus! ), tiny baby stalks of daylilies (cucumbers! ); sheep sorrel (also citrus-y), and the leaves of Queen Anne’s Lace (carrots). As we got closer to the open ocean, Hennessey discovered a crop of sea peas. “We use these a lot,” he told us. “We use them raw as garnish, saute them, and flash-fry the tendrils in rosemary oil.” Kaden stopped for a moment to give one a try, and then asked for another. On a recent visit, we tasted sea urchins with gracilaria, scallop crude with dried sea lettuce, oysters served with a dulce mignonette, fresh pollock steamed in sea water with pureed sea lettuce, chocolate ice cream thickened with Irish moss, and chocolate mousse and homemade marshmallows set on a caramelized beet glaze with basil oil highlights. Garnishes and ingredients of growing-in-the-wild flowers, buds, tendrils, leaves and pods were artistically placed and used throughout the dishes. It was delicious and different, and we knew exactly where much of it came from, culled on a morning walk through seaside woods and along the New Hampshire shoreline. Stages, One Washington St., Dover, NH, 603-842-4077, www.stages-dining.com. Kitchen Table open Wed.-Sat. ; dining room open Fri.-Sat. Reservations required. Four course, prix fixe $50, Secret 8 $100, 12 course Nature/Technique $150.